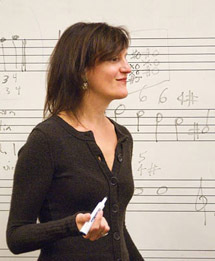 Kate van Orden after receiving a Ph.D. in Music History and Theory at the University of Chicago in 1996, held fellowships at the Warburg Institute in London and the Columbia Society of Fellows in the Humanities. She taught at the University of California, Berkeley from 1997 until she joined the Harvard faculty in 2013. In 2016, she was named a Walter Channing Cabot Fellow in recognition of her recent book, Materialities. Dr. van Orden’s work has been supported by two AAUW Fellowships (1994, 1999), two President’s Fellowships from the University of California (1999, 2006), and a fellowship from the ACLS (2010). From 2003-2005, she held a Studium Fellowship from the Centre National de la Recherche Scientifique, which allowed her to work at the Centre d’Études Supérieures de la Renaissance in Tours, France. National awards include the Paul Pisk Prize, the Noah Greenberg Award, and the Lewis Lockwood Award, all from the American Musicological Society, as well as the Nancy Lyman Roelker Prize from the Sixteenth Century Society for my article titled “Female Complaintes” (Renaissance Quarterly, 2001) and the Richard S. Hill Award from the Music Library Association for my discovery, with Alfredo Vitolo, of a large Renaissance music library, the Pagliarini Collection (Early Music History 2010). International distinctions include the bi-annual book award from the Society for Renaissance Studies for Materialities (2015) and the Medal of Honor from the city of Tours, France (2016), for outstanding contributions to our understanding of the Renaissance. Dr. van Orden currently serves on the editorial boards of Early Music History, Saggiatore Musicale, Oxford Bibliographies, and the series The New Cultural History of Music; she was Editor-in-Chief of the Journal of the American Musicological Society from 2008 to 2010. Her service to scholarly societies includes acting as Discipline Representative for Music for the Renaissance Society of America (2012-14) and serving on the Board of Directors of the American Musicological Society (2012-14).